An old hand by now at promoting A7X albums and tours, Shadows now finds himself in the odd-but-cool position of pimping a video game, Hail to the King: Deathbat. Created by Avenged Sevenfold in conjunction with Subscience Studios after nearly two years of development, and inspired by the group’s artwork and lyrical imagery, the complex action-adventure mobile game features classic hits from A7X—players can also unlock eight new instrumental tracks—and includes player characters based on the band members themselves, including late, great Avenged drummer Jimmy “The Rev” Sullivan. An avid gamer since childhood, Shadows understandably can’t wait to get out there and tell the world about it. REVOLVER Hail to the King looks much more involved than your typical shoot-’em-up or hack-and-slay mobile game. 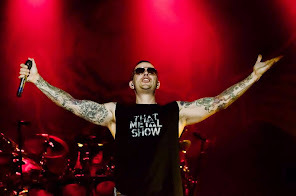 M. SHADOWS It is, man, and that’s a big reason why I wanted to come out to San Francisco, meet with people face to face and get the game in their hands. It is a very big game for the mobile platform. We’re pretty much making a console game, and squishing it down as much as we can to fit it onto your phone and some of the other high-end devices. We’re actually trying to tell a story with our game. And it’s something no band has ever done before. We wanted to do it for mobile devices, because most people have smart phones, so this is a way to get a cool story into people’s hands. When you make a Triple-A console game, the development can take five or six years and cost close to 200 million dollars—and we didn’t want to just slap our name on something and have the people who invested that money tell us how the game is going to end up. Something like this, we were able to fund it ourselves, we developed it ourselves, we’re publishing it ourselves, and we have complete control over it. Everything that’s in this game is from us, and doing a mobile game has allowed us to do that. How would you describe the basic concept behind the game? You basically go around fighting all these demons who have taken over your world and killed your people. It’s an action-adventure, along the lines of Zelda and Gauntlet. It’s got a lot of old-school nods, a wink of the eye to people in my generation who grew up with old Nintendos and cartridge games—but it’s also got a new-school flavor. We recorded eight songs for the levels, which are all nods to 8-bit, Castlevania-type music. This isn’t the sort of stuff you’d release on an Avenged Sevenfold album, right? It’s a completely different genre of music—it’s like neoclassical, but with 8-bit sound. But you can also fight to the real tracks of “Nightmare,” “Afterlife,” or “A Little Piece of Heaven,” depending on which level you’re on. And we’ve built worlds around some of our bigger songs. For example, there’s a level called “Bat Country,” which is like this desert with all these caves—and when you fight the Bat King, “Bat Country” plays. You can play as band characters, if you want, and we also have non-player characters who you’re talking to throughout the game. Like, there’s an Avenged Sevenfold fan on one of the levels that talks to you out of the blue. When you’re making a virtual world like this, you can basically do whatever you want, so we had some fun with it.